In this video tutorial, Ryan Young teaches us how to deal with a disc with low spin. His strategy is to quickly and precisly set the disc and make a catch. This is a great skill to master as it allows for using more of the spin before catching and for recovering from errors that use up most of the spin. Ryan gives excellent detail in the video, but the gist is this; delay the disc in the center as long as possible. Then, spiral out to 10 o’clock for clock spin, or 2 o’clock for counter spin, and just touch the rim long enough to set the disc do it falls into the pocket. The center nail delay is the basis for much of Freestyle Frisbee. It is the act of spinning the frisbee on your finger nail. Matt explains how to practice so you can master this skill. First, give yourself a two handed throw. Be sure you choose the spin, clock or counter, that you want to practice. This throw is good because the disc comes to you perfectly flat. Now, let the disc land softly on your finger nail. Most people use the index finger, but any finger nail works. In fact sometimes I use two, or all five (the claw). Keep the disc above your head so you can see the center. As the disc slides on your fingernail, move your finger so it stays in the center. This may mean moving your feet to pursue the disc. Stay loose and chase it around. If it falls all the way to the rim, no problem. That’s called a rim delay. Just let it spin there, trying to keep only your fingernail contacting the disc. The rim delay is also a useful skill. As you get better at both the center delay and the rim delay, bring your arm down until you have control while looking at the top of the disc. Have advice for someone trying to learn this skill? Let us know in the comments. Lori Daniels demonstrates going from a rim delay to a center delay. This is a critical skill that marks a new level of nail delay control in one’s game. It is used all the time since the disc may come in at and any angle. It is also used if center control is lost. As this skill improves so will center control and eventually you’ll be able to set and angle you want. Here Lori uses a technique swooping down and then lifting upwards. As the disc travels up push across at a right angle to the center. This will cause the disc to tilt and flatten outs. As it flattens spiral your nail in towards the center and gain center delay control. For an in-depth written description of this skill, check out this article I wrote back in the 90s. Ryan Young demonstrates the Under the Leg nail delay pull directly into a set. With clock spin, start with a center delay. Set it up flat a few inches. Then reach your right hand under the inside of your right leg. Aim for about 9 o’clock on the rim. As the disc lands on your nail, pull it under your leg using the rim. This will cause the disc to pivot on a rim delay for a fraction of a second. Rim swoop the disc to your right side and set it back into the air. Timing here is key. The longer and / or faster the swoop, the steeper the set will be. So, you can set it perfectly flat, or you can set it on a steep angle. This set is very useful for going into other restricted delay pulls, spins, chest rolls, or catches as Ryan demonstrates. Ryan Young shows us the center nail delay from the perfect perspective, Make little circles to keep the disc balanced. In this video I talk about the basics of a flat nail delay and a rim delay. 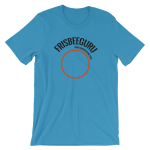 In Freestyle Frisbee, a Delay is when the Frisbee is kept spinning on one’s finger nail. This can be done either in the center of the Frisbee on in the rim of the Frisbee. Most people want to learn the Center Delay immediately. However, it can take many hours of practice to get it down. The way I learned was by starting with the Rim Delay. This kept me from getting frustrated by not mastering the Center Delay right away. I learned to pass the disc under my legs and behind my back, all with a rim delay. Over time, I began to understand how the disc progressed naturally in a circle and how to control it better. And then, one day I could keep it in the center. So, don’t overlook the rim delay as you’re learning new tricks. tools required, initial tooling in my mind has a couple paths. you want to learn to keep the disc in the air as best you can. one more proficient than I.
center. It can take some time and repetition to get there. still in the center of the disc! For most learning to go from a high Z rim delay to a center delay marks a whole new level of understanding in disc control. It means being able to bring most any angle throw back to the center, increased center control, and leads to understanding angle changes and off center tips. For me this skill took some practice. To accomplish this task it helps to be able to throw a high Z steep angle to your self. To learn clock right hand throw a right handed backhand throw with tons of spin. It should come off on a steep angle, nearly perpendicular to the ground such that the bottom is pointing more downward than the top and the nose is pointing to the right. It should also be perpendicular to your chest plane. Now that the disc is in the air use your right hand and take it on a rim delay. Your palm will be facing to your left and your finger(s) should be curled under the rim. Let the disc hang in this position long enough to get it under control but not so long that it tilts around so the nose is pointing to your body. From here there are two common methods of getting to the center. 1: Give the disc an upward tug. As it lifts up hold your hand still so that the bottom of the disc rides along your finger nail(s). Once your nail is near center push hard to the left. The ideal location is it about 6 o’clock halfway between the rim and the center. As you push to the left the disc will flatten out. Once it is flat get the center delay under control. 2: Gently swing the disc forward. As the disc swings forward the rim will pull against your nail forcing the disc to level off. Once it is halfway flat move your nail to the center and gain delay control. To learn counter left reverse the right/left directions as if looking in the mirror. Once you become proficient at this maneuver try it on a different angle or the opposite hand. Example, once the disc is on a rim delay let it drift around on your nail until the nose is pointing upwards to the left perpendicular to your chest plane. The motions are the same. Give it a tug so it rides up your nail. Now push right at 12 o’clock between the rim and the center. It will flatten out as before. Note: you may have to duck your forearm below it to keep from knocking it off your finger. The biggest thing to learn is that the location to press in with changes based on the direction of the nose. It’s always 90 degrees ahead of the spin from the nose. So, with clock spin, if the nose is pointing away from you (12 o’clock) push it out so the disc rides up your nail, then push towards you at 3 o’clock. With counter spin you’d push at 9 o’clock. Once this becomes second nature try flattening the disc directly from the throw with a tip. The physics are the same. Just tip it up 90 degrees ahead of the spin from the nose. You can also try to flatten it out from a rim delay to a flat set. This set it the beginning to many moves and catches such as a scarecrow and a one and a half btb.